The world is coming to an end soon... the evidence is all around us, but the clearest indication is in the way the gaming industry is reacting to the changing environment. I saw a BBC Horizon documentary recently that said, "Forget Global Warming, there's something called Global Dimming going on." Incidentally, according to the BBC, there's something called "Global Weirding" going on as well. I watched their documentary on this as well, and strangely, it was not about Lady Gaga or Nikki Minaj, or whoever else is now vying for the WWE (World's Weirdest Entertainer) title. But I say the BBC has got it all wrong. Forget Global Dimming. There's a serious problem of Global Dumbing going on. The gaming industry has reacted accordingly, and that is why I now spend my free hours watching BBC documentaries, over and over again, rather than gaming. For someone who used to play strategy games 90% of the time, I find it hard to find even a single decent one to play today that will not cause me to gouge my eyes out in disgust because of the last-decade graphics. Anyway, "Converted", not "Cancelled". That's probably the only thing keeping the people around me alive for now... "Converted" to be a Free-to-Play title, which, from what I have seen on the Internet, is another sure sign that the world is going to end/the Devil is taking over. Free-to-Play is basically a way for game companies to lure you in and then charge you for everything in the game if you really want to play and not just mess around - pretty much what Zynga specializes in, with their despicable gaming model. Want to build Nuke Cannons like the Blue guy (and win)? Well if you'd paid the $100 extra for them you wouldn't be stuck with just Humvees you Yellow chump. 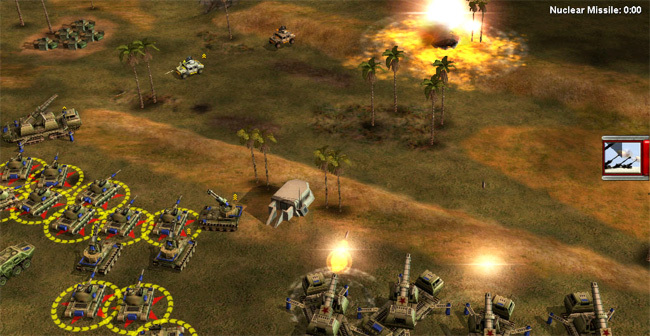 The video in this article is embedded from the official Command & Conquer YouTube Channel. The screenshot is from one of the several hundred epic showdowns I've had with Rajiv and Pok in C&C Generals... I suspect the foolishly valiant Yellow chump trying to attack my invasion force was in fact Pok. 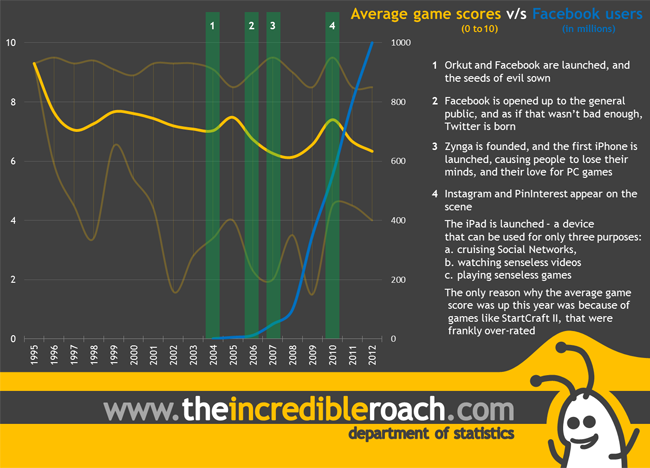 The neat graph was made by me using game scores for RTS games from Gamespot, and Facebook subscriber figures from Ben Foster's Blog. Osama 2... Coming soon to a country near you!